Good sherry whisky, differs from the sherry mainstream by leaving in coffee-chocolate shades, moderately sweet, tart, well-balanced, spicy. Open, dry, pre-foliage, herbarium, old furniture, raisins, kvasnoe wort, dried fruits, dust dried apricots, honey, mineral shades, stone crumbs, lemon candied fruits, burnt caramel. Saturated, oily, oak, bitter-sweet notes, bark, creamy confectionery shades, burnt biscuits, ginger, dried fruits, citrus fruits, roasted nuts, cappuccino. Spicy, oily, warming, lemon slice in tea, creamy-oily hues, coffee with condensed milk, bitter chocolate, burnt biscuits. The nose was great, the mouth would have been better at higher ABV but was very enjoyable. A very fine old Balblair.Initially blind tasted and then retasted. August 2016. Waxy and fruity nose. Apricot, banana. Varnish. Chocolate too. Warm. Honey, caramel, milk chocolate, orange. Some wood. Long and dry. Fruits and spices on the background. Phew. Well fruity (orange juice and blood orange, marmalade, apricot jam) and elegant old sherry: tobacco, plum, resin, leather and old wood. Very classy and relatively powerful. Yum, I love it. In continuity but more finesse and a little more shy, less punch. Many sweet spices, orange juice. It is at the same time sweet and well-wooded. Clove. Long but light enough. No more bitterness, bitter chocolate. Very lemony nose at first sight. Round and well balanced. We follow on apple, orange. Then mint wakes up. The roundness turns into freshness over the minutes. Then the exotic comes as a bomb. Then finally a little vanilla and a slight smell of cognac. A changing and complex nose. Magnificent. It smells like killing. In the mouth the fruit does not betray. A bit of strawberry more? A real fruit salad. I put the nose in, I now have a hint of smoke, which starts immediately. Final a little vinous and always fruity. A bit of nuts added (almonds). Not far from a final of old cognac. A touch of ginger to lift the whole thing. N: Floral custard apples and orange scented candles with strong, oily, fruity [apricot] tincture/marmalade notes up front. Also: moss, suede, aromatic joss sticks, lime, ginger and carrot cake [sultanas] with caramel icing, succulent pineapples, rose water and honey [baclava glaze vibe without the nuts]… a damn fine nose. T: Charmingly relaxed arrival offering sweet cereal fruits first turning jammy straight after. Exquisite and broad mouthfeel despite its minimal 40% abv. Lots of sweet apple tannins reside. Quite oily and jammy with a mouthful that grows on you. Estery/tannic apple notes are abound along with a light milky hot chocolate. F: The wood presence softens everything,turning to eucalyptus snow pears. Drying, sweet and tannic. Old oak glistens best at the death along with a mild turmeric laced curry and soap note. hold of a bottle, though. and fruity with sultanas, candied oranges, apricots and grilled pineapple. coffee. Crème au beurre. Pistachio nuts. Wonderful. complex. Midpalate, the oak starts to speak, but it all remains quite fruity. Excellent nose with big fruity notes. Plenty of oranges and dried apricots. Some yellow raisins. Cinnamon and cocoa. Waxed furniture and old oil paintings. Hints of cigar boxes. Subtle sherry in this one, very refined and lots of character despite the lowered strength. Nice but not too punchy. Again some oranges with a dash of honey and a caramel sweetness. Becomes fairly dry in the end, with oak getting the upper hand. Quite dry but long with lingering fruits and soft herbs. 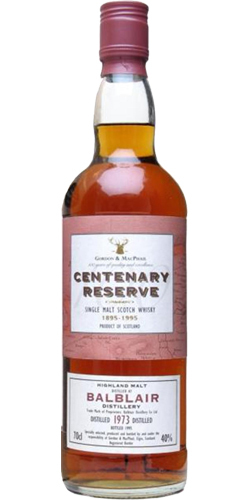 & Macphail in 1995 as part of the celebrations for their centenary."